Feasts are often held in locations that are chosen for convenience – the cost, the quality of the kitchen and parking availability are often of much greater concern than the décor of the location. One of our Medieval group’s favorite locations for larger events is the local National Guard Armory. The cement floor is indestructible enough for armored martial arts combat, there is a decent commercial kitchen available, the bathroom facilities are enough for a fairly large feast, and there is adequate parking around the building. But…the walls are white cement block, with bulletin boards, and permanently attached pictures of commanding generals and government officials. We are permitted to remove the ¾ life-size freestanding recruiting posters of female MPs with rifles and perfect eye makeup, but much of the remaining décor is immovable and far from Medieval. So what could we do? 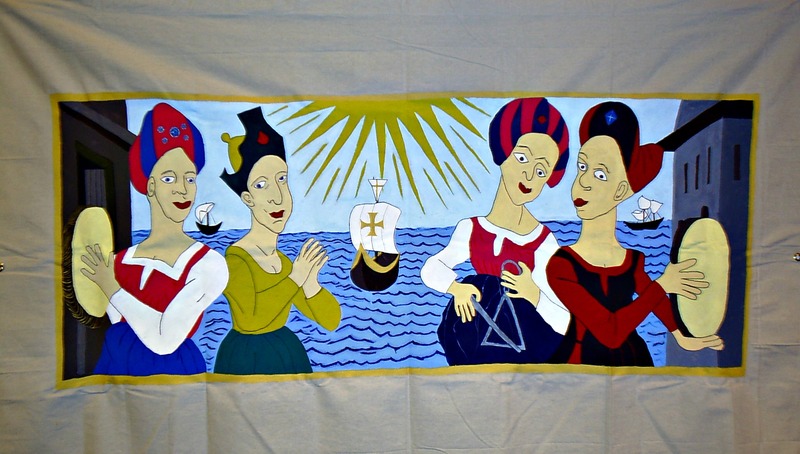 I was fortunate, in my early years in the Society for Creative Anarchronism, a Medieval reenactment group, to have been present for the transformation of a room. The site was a High School in New England. The classroom had white cement block walls, ugly industrial drop ceilings, linoleum floors and a stack of desks and chairs. The room, ironically enough, was a theatre arts classroom, and I like to think that they would have been fascinated by the transformation that occurred. Chairs and tables were pushed to the end of the room and free-standing partitions made of wooden poles in stands and painter’s canvas walls were installed, creating a room within a room. 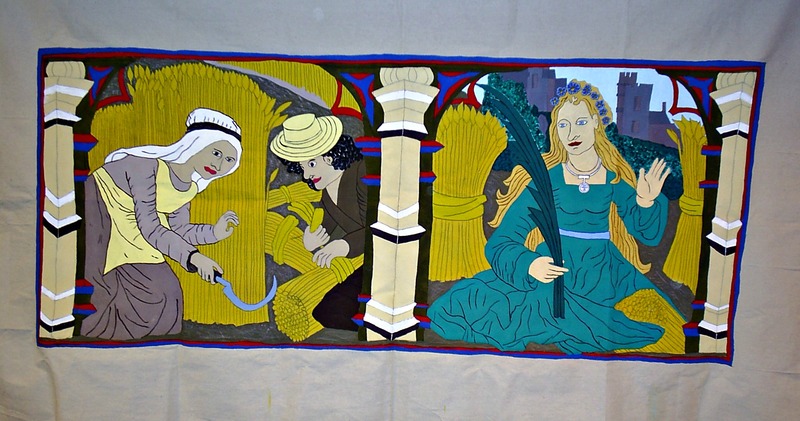 The canvas walls had been decorated with paintings in the form of reproductions of illuminated manuscript pictures. The floors were covered with Persian rugs. A hidden boom box provided soft renditions of Medieval music and the final touch – candle lanterns, allowed the drop ceiling to disappear into the darkness. It was a stunning vignette created, almost as it would have been on a real stage. Because of my experience with room transformation I knew what we could do to improve the décor at the Armory. So I gathered my volunteers and the process began. First I located copies of Medieval woodcuts and other Medieval pictures that were public domain. We purchased the nicest medium weight painters’ tarps that we could locate. 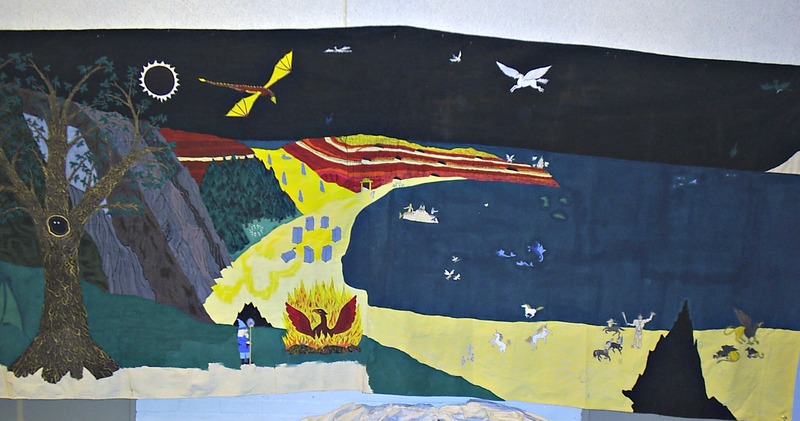 The tarps were taped to the wall in our home workshop, and a digital projector was used to project pictures onto the canvas. I then traced the pictures with black magic markers. The canvases were then passed off to other people, who painted the pictures, adding color and dimension to my lines. Three canvases were completed with authentic Medieval pictures and one of our members painted a collection of mythological beasts on another. Another one of our members offered the use of a “fake brick wall” – simple bricks printed on plastic sheets. 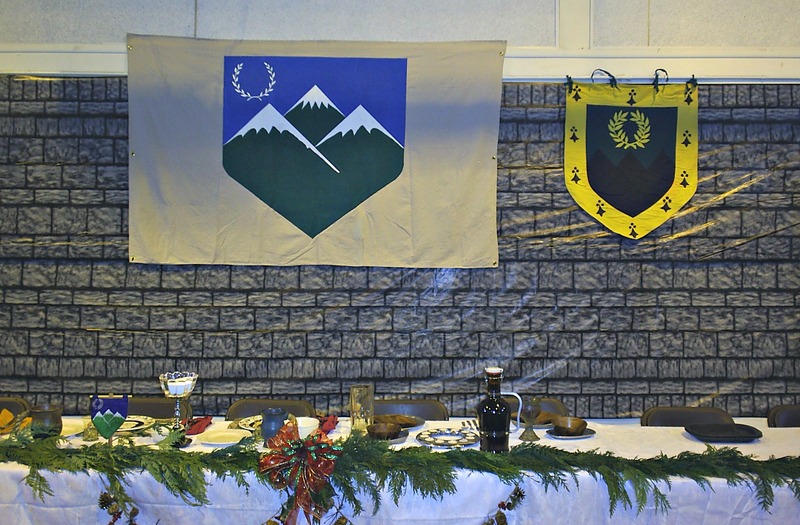 The “brick wall” was placed behind the head table and bedecked with the banners belonging to our group and our neighboring group. We then used the painted canvas walls to cover the most annoying décor. 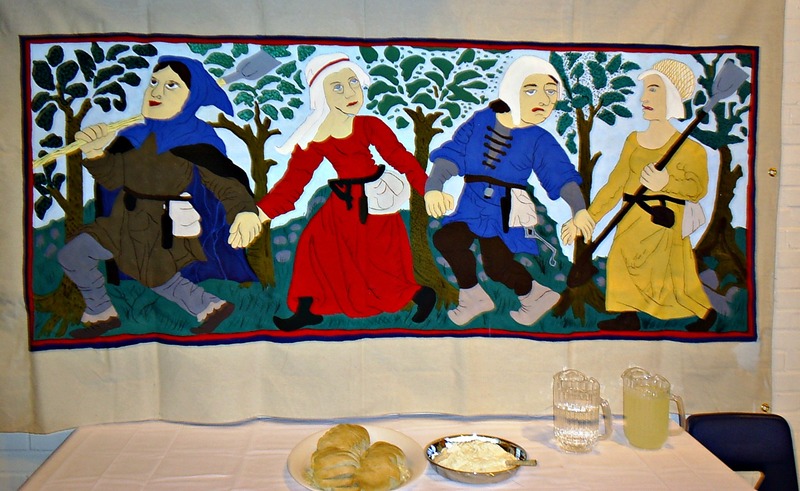 The dancing peasants covered the wall immediately above the snack and dessert table. If you are wondering what is one the table the answer is a tray of homemade bread, a bowl of homemade soft cheese, a pitcher of ice water, and a pitcher of homemade lemonade. The Italian Musicians covered a bulletin board. Mother Nature and the Harvesters bedecked another wall. And a collection of mythological beasts covered another bulletin board. Our goal is to eventually have enough canvas panels to cover as much of the walls as we want to. One of my next projects will be to choose cooking and hunting scenes to add to the collection. Many of the tapestries that I saw in museums in Europe contained hunting scenes and there are some excellent cooking scenes in the Lutrell Psalter. I am also considering some architectural panels – canvas panels with castle walls and arched doorways painted on them. This entry was posted in The Production of a Medieval Feast by Eirny. Bookmark the permalink.